We decided that it was time to fish the southern part of the Connecticut River yesterday. Our plan was to scout out a few spots that had decent reports from throughout the season. The first setback we fished was a big one! It was a little overwhelming to look out across it and only one tank of gas and temperature hovering around zero with a wind chill. Without hesitation, we set out for the biggest inside turn we could find that wasn’t crowded but help several hard-sides. The plan was for one of us to cut holes while the other followed behind with the Aqua Vu camera. This is a great way to learn new water fast. Well, we cut and cut and looked and looked and all we were seeing was sand with no weeds what so ever.This has been the case on the river this year since Irene sucked most of the weeds of the setbacks. Twenty holes and nothing, time for a big move, 20 more holes and nothing. I talked to a local who gave us a tip and we headed that way. I cut some holes – first drop Dylan drops a crappie in the hole, good sign! We fished the rest of the holes and caught a bunch of dink perch. I started to cut a line where I thought there was a channel. My experience was that panfish will use these channels in these setbacks as travel corridors and also ambush points. 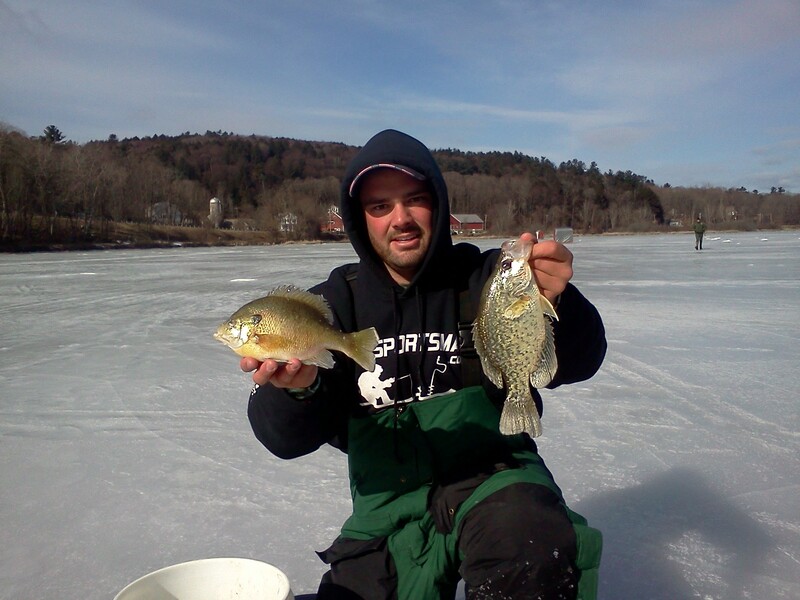 Finally, we got into some big bluegill and Dylan manages to pull two crappie. After a friendly check by the warden, we headed north. The next setback was much smaller. We went past the first group of tip ups and around a point. Cut a hole, maybe an inch and a half of white ice! Yikes! Bye Bye. Next stop was a familiar one. When we got to our last spot, cut our holes for the day, and watched a kid fish out of square holes he was cutting with a chainsaw! Oh boy! We got into some nice big river perch and managed to pull a lot of small crappie. Probably 30 crappie caught in 4 hours. All in all, we had a productive day. Hot jig was a chartreuse and orange Caty jig teardrop. We learned where to try again and where not to. Enjoy!